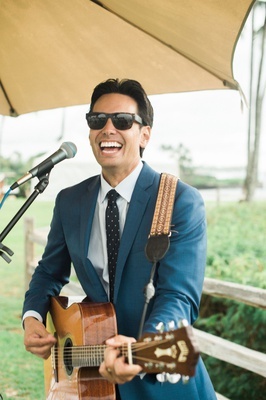 When planning began, the bride was also furiously multitasking – completing her master’s thesis, preparing for orthodontic residency, and starting off a new career – so she was grateful to have Nicholas take charge during the first few months. 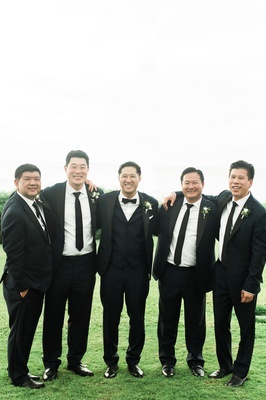 The groom took time to focus on their guests who would all be traveling for the occasion: “I wanted to make sure that everything was as easy and convenient as possible,” he says. 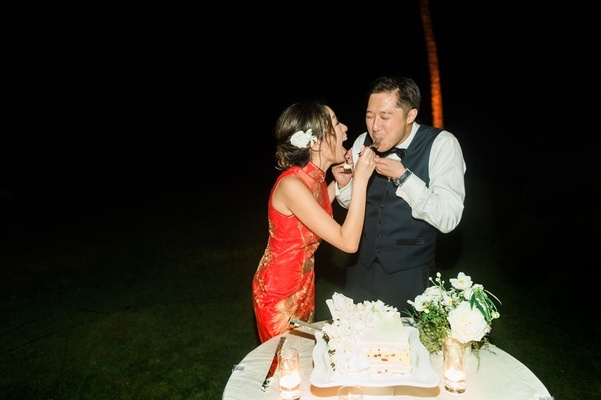 The wedding weekend began with a traditional Chinese tea ceremony, which included customs cherished by Nicholas, including the bride donning a gorgeous red silk gown. 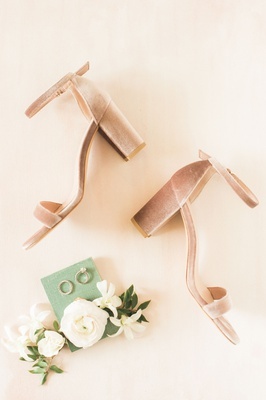 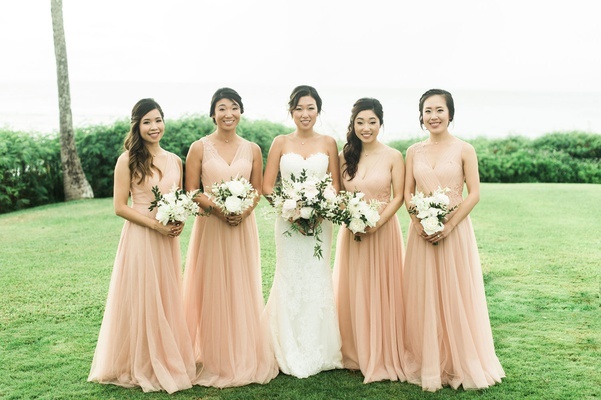 As guests arrived for the afternoon ceremony the following day, they found the picturesque area of the Namalu Lawn decorated in muted shades of blush, peach, and cream. 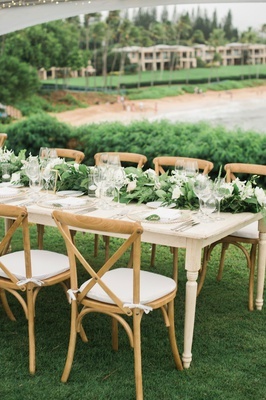 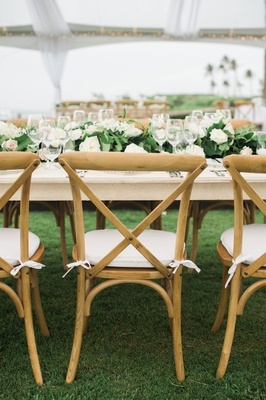 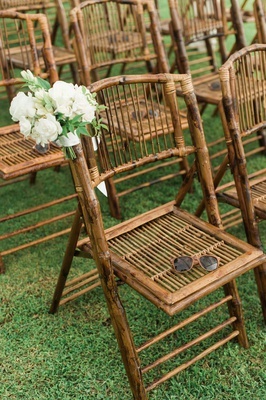 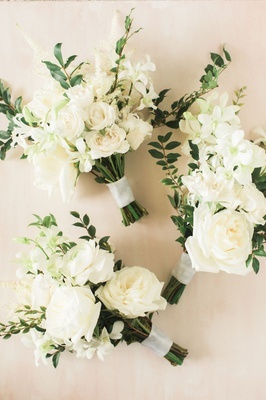 Bamboo chairs were placed beneath wooden structures bedecked with verdure and sheer ivory fabric, mimicking the style of the arbor created for the vow exchange. 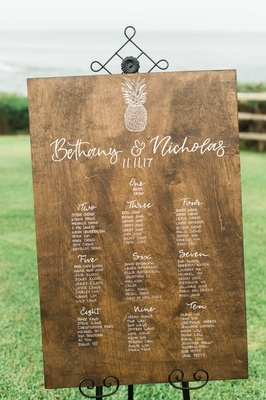 Bethany and Nicholas were equally timeless in their attire: the bride in a strapless trumpet gown of lace and the groom in a dark blue tuxedo with a crisp bow tie. 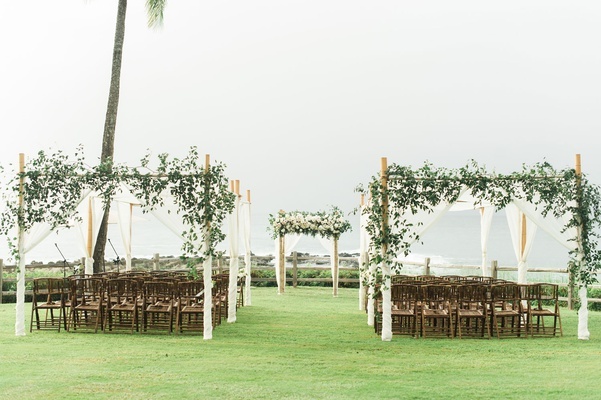 The classic décor continued to reveal itself in the reception space located on the cliffs of Kapalua Bay overlooking the ocean. 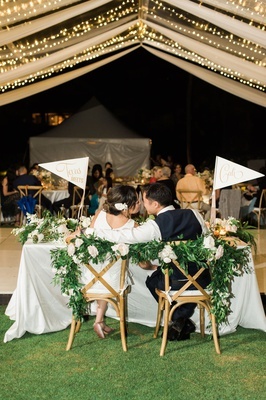 “We wanted the place to feel really magical and special for our guests,” Bethany explains. 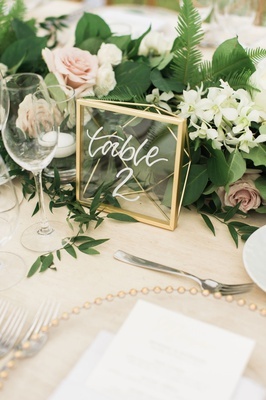 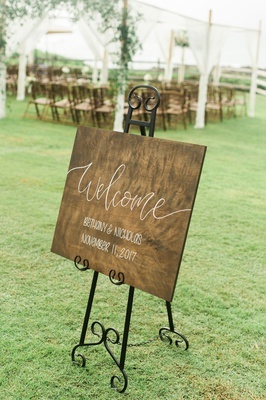 “We used clear tents with ivory draping and twinkle lights on the ceiling to make it feel like they were dancing underneath the stars.” Bamboo signage with elegant calligraphy welcomed attendees and provided seating information, whilst the same handwriting was found on glass table numbers placed in gold frames. 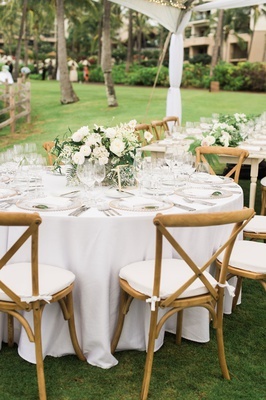 Tables were cloaked in bright white linens and bedecked with floral centerpieces in a dreamy pastel palette. 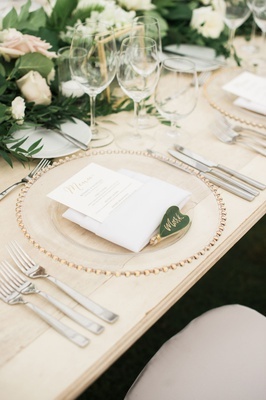 Charger plates rimmed in bullion were topped off with a custom menu card and a single green leaf noting the name of each respective guest. 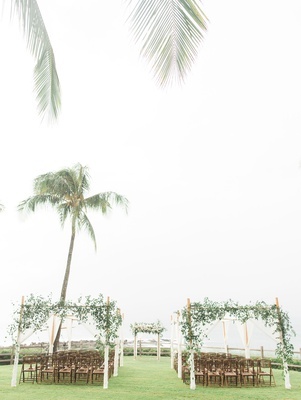 The newlyweds admit that though the day felt to have passed quickly, it was filled with many wonderful moments. 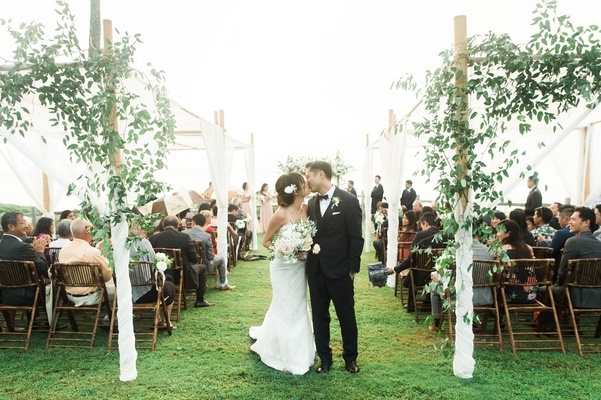 For both of them, the ceremony was extra special. 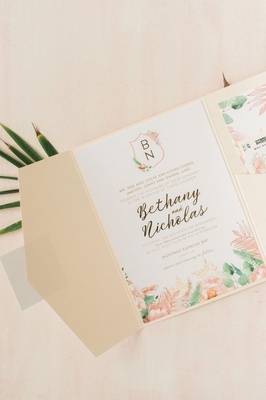 “Nick and I were debating whether we wanted to write our own vows, as both of us are very private people and it was scary to share something so personal,” Bethany explains. 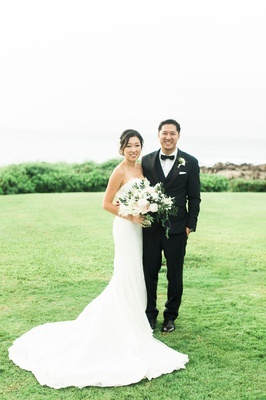 “But I’m so glad we did because it was one of the most memorable moments.” Nicholas describes the romantic memory: “It was amazing to hear the waves crashing on the rocks while reading our vows to each other.” As the twosome left Maui, they looked forward to planning their honeymoon and enjoying their new life together.